As graduate students, you have to read a lot of papers and probably some of them make you fall asleep! Why? Do you just have a short attention span? The real reason is more likely because the authors lose you in the first paragraph -- or even line -- because often times writers don't connect their ideas. We'll review a sample paper: "Politics of Preserving Paradise." This paper received an "A" in ESM 241, and the instructor said it was the best paper she'd seen. It is a really sophisticated example of transitions: at no point in this paper do you feel lost, but it doesn't feel repetitious either. In the example above, what does consequently signal? If you answered "cause and effect," you are correct. What other transitions could you use to signal cause and effect? In the example above, yet indicates contrast. For which ideas does it indicate a contrast? Whereas beginning, or surface level transitions are usually single words or phrases found at the start of a sentence, intermediate transitions are embedded in the sentence. For example, shown below is the use of "in contrast." Often, beginning writers will simply state "in contrast," at the beginning of a sentence, which is a dangling transition. To improve the clarity of your writing, try to answer "in contrast to what?" by completing the phrase, as shown in the excerpt below. In this case, the prior paragraph (shown below) addressed the minimal opposition to the creation of a national monument in Hawaii. The phrasing shown below says "here's what we talked about before, here's what we're talking about now, and here's how they relate." If you now return to the sentence that starts with "in contrast," you will see a sophisticated transition from the sentence addressing opposition to a sentence explaining the significance of this minimal opposition. Another example of an intermediate transition occurs in the second sentence. By stating that the decision received additional backing from Lingle, the writer links the sentence to the previous sentence which stated that native Hawaiians supported establishment of a National Monument. Advanced transitions move beyond phrasing and use entire sentences to connect ideas, both between and within paragraphs. There is no formula for these types of transitions, so it is best to identify strong models, as shown here. 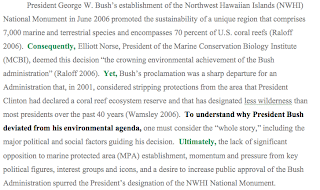 The phrase "to understand why President Bush deviated from his environmental agenda" serves as a signal phrase by drawing attention to what comes next. Signal phrases alert the reader to important information. In the following example, although serves as a beginner transition, however, the rest of the sentence refers to the previous paragraphs, links ideas, and answers the "so what" question, making it an advanced transition. Advanced transitions often involve a set-up in prior sentences. In this case little resistance in the first sentence sets up the opposition statement in the second sentence. The final sentence serves as a clear and unusually strong transition. It reiterates ideas discussed in previous paragraphs, but doesn't stop at simple summary. The sentence incorporates the summary into the next idea, improving flow and building a clear, logical argument. The sentence emphasizes the significance of ideas presented earlier in relation to what is going to be said next. Using transitions effectively is a dance between setting things up and executing them. Oftentimes, we assume that the reader knows what we're thinking, but we need to guide them through our though process by using signposts and signals. The following is a list of questions you could ask yourself when reviewing your writing to determine if your writing is clear and your transitions are effective. Am I preparing the reader for what I'm about to say? How am I connecting my ideas? Do I make clear why I'm giving the information in a certain order? Are the relationships between ideas/concepts made explicit? When editing your papers, use the visualization exercise we've demonstrated here. Color code transitions in your paragraphs (you can even use different colors for different types), then skim your paper. Is each paragraph well-populated with transitions? If your whole document is still black/grey, or if you only use beginner transitions, then you could probably work on improving your transitions. Conversely, if you see a variety of transition types in each paragraph, then you can probably assume that your document is clear and has good flow. The ease of developing these transitions may depend on the document you're writing. Writing that tells a story or process or that is organized chronologically lends itself more easily to transitions than writing that describes complex concepts. The trick is, you can't really write anything without understanding it: you have to achieve clarity in your thinking if you wish to achieve clarity on the page. So, if you're talking about two ideas that seem disparate, you have to ask yourself, "Why are these ideas both in the paper or assignment prompt to begin with? How do they relate to each other?" Then, show these relationships using transitions to emphasize their connections or contrasts. If you have further questions about transitions, please visit the Communications Center website to schedule an appointment.